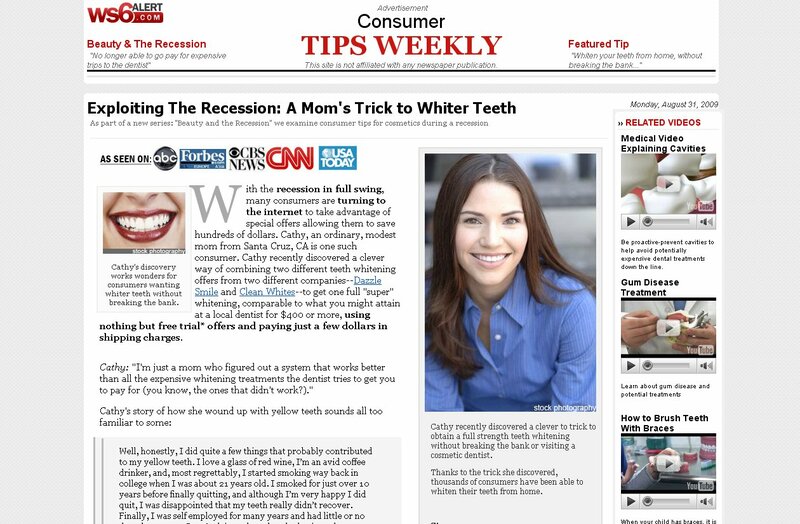 Teeth Whitening Trick: Discovered by THIS MOM! 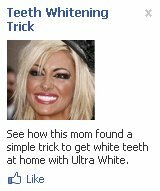 Obviously, sometimes it’s called Ultra White and sometimes no name is ascribed to this miracle system of teeth whitening. 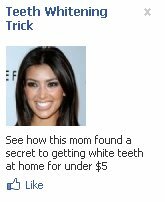 But each ad is worded nearly identically and claims that this is the mom who discovered it. Notice in the first image how the woman is standing in front of one of those sponsored backdrops they take pictures of celebrities in front of at events? I don’t personally recognize her, but I’m sure she’s someone at least marginally famous and not some random suburban mom. The third image looks to me like Jane Seymour with Photoshopped hair. Regardless, they are most definitely not all the same woman! This time our mystery mom gets a name. Two different names, actually. We’ve got Kelly, the smiling blond on the first website, and Cathy, the brunette in the image that is actually labeled “Stock Photograph” on the second website. And the websites are pretty much word-for-word identical (there is the occasional change, but those are rare). The ad along the side of the first website is for one of the two products the offer tells you to buy, so it’s very much tied in. These ads are everywhere, so whoever is behind this campaign must be spending some money on getting them out there. What I can’t figure out is, why didn’t they spend any on making them? The many different and obviously fake photographs are really what caught my attention, but there is a lot about this ad campaign that suggests that you shouldn’t buy the products. It’s not that hard to put together a cheap campaign that doesn’t look skeezy like this (if they had just taken a photograph of a woman they knew in front of a tree or something and used it consistently I probably wouldn’t have even noticed the bizarre inaccuracies of the campaign and investigated further, since that would have given them more of an air of credibility than using celebrity and stock photos). 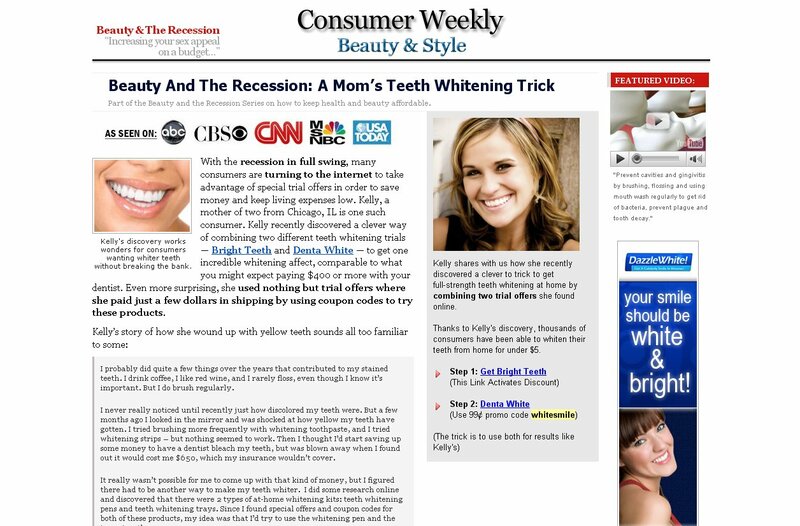 The lesson here is: spend some money on the ads, not just on placing them! This entry was posted on March 17, 2010 at 12:00 pm	and is filed under Beauty. 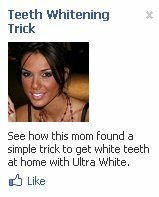 Tagged: dazzlewhite, facebook-ad, teeth-whitening, ultra-white, website. You can follow any responses to this entry through the RSS 2.0 feed. You can leave a response, or trackback from your own site. I’m surprised you didn’t say anything about their irritating implication that moms make discoveries so rarely that its worth a surprised mention. I actually did start writing about that, and about how we only get pictures at all since the “mom” is clearly so young and hot, but it got way too long and I had to cut something. I had lots to say on this one and eventually had to pick and choose what got included or I’d end up with a post too long for anyone to read it!